JumppaPomppa is a pull-on dog sweater, which is easy to put on and comfortable to use. The backside is made of anti-pilling knitted plush, and the bottom part of water-repellent thermal tricot fabric. Reflectors along the side seams guarantee that your dog will also be seen in the dark. Jumppa is anti-static, and it can be used under a Pomppa coat or by itself. ToppaPomppa Insulated is a well fitting thermal coat for your dog. The thick coated outer fabric, warm synthetic insulation and soft teddy lining keep the warmth in and the cold out. 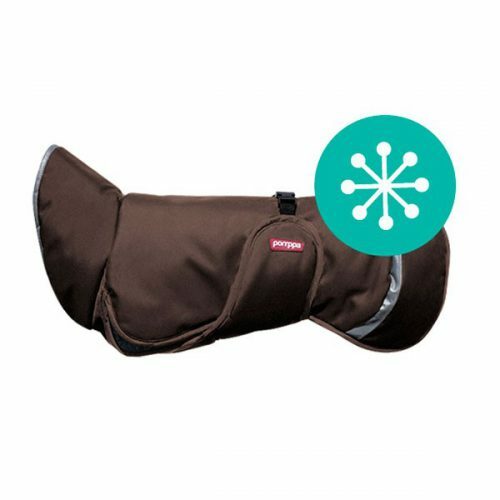 The sizing on Pomppa Insulated is larger than on Pomppa Basic; if the lenght of your dog’s back is between sizes, you should choose the smaller size.